Figure 1. Simplified geologic map showing the locations and rock formations of the gneiss-hosted corundum occurrences in the Day Nui Con Voi range and marble-hosted occurrences in the adjacent Lo Gam structural zone (modified after Xuyen, 2000 and Vinh, 2005). Mineralogical and chemical studies have shown that the gem quality of ruby and sapphire grains from Tan Huong–Truc Lau deteriorated substantially after their formation due to this corona texture. Corundum occurrences in northern Vietnam are hosted not only in marble but also in partly migmatized gneiss. Gneiss-hosted corundum deposits are located mainly in the Tan Huong–Truc Lau area of the Day Nui Con Voi range in the Red River shear zone (RRSZ, figure 1). Here the partly migmatized gneiss contains gray, grayish white to bluish, and yellowish gray sapphires, while dark red to pinkish ruby occurs in the marble lenses intercalated with gneiss and in the weathered feldspathic pegmatoid rocks (Khoi et al., 2011, 2016). The gemological properties of corundum from the Tan Huong–Truc Lau area and the mineralogy, petrology, pressure-temperature (P-T) formation conditions, and genetic model of these gneiss-hosted deposits were reported by Khoi et al. (2011, 2016). One of the remarkable phenomena of these deposits is that in some secondary (alluvial and diluvial) and primary deposits, the corundum is frequently surrounded by a well-developed spinel corona. This corona mainly follows the morphology of the corundum crystal. These encrusted stones have an unattractive yellowish gray or brownish gray to almost black appearance until the spinel corona is removed to occasionally uncover a gem-quality corundum core (figure 2). Figure 2. Some encrusted stones have an unsightly yellowish gray or brownish gray appearance until the spinel corona is cut away to reveal a gem-quality corundum core with an appealing color and possibly a star effect (right). Photos by N.N. Binh, DOJI Gold & Gems Group. Several questions related to this mineral assemblage arise. Why did the spinel corona form around the corundum core, and what reaction(s) occurred during the corundum → spinel transformation? What were the characteristics of the corundum before this transformation, and how was its quality affected afterward? What was the original host rock? These questions are of scientific and also economic importance. According to the information from DOJI’s Truc Lau mine (Khoi et al., 2011), approximately 30% of the corundum recovered from this type of deposit has a spinel corona, which sometimes hides the gem-quality corundum core almost entirely. To answer these questions, we have conducted a petrographic (macro- and microscopic) and chemical study of corundum with an associated spinel corona. This data set, together with available published P-T conditions of the host rocks (Khoi et al., 2016) and thermodynamic phase equilibria calculations as well as inclusions in mineral phases, was used to explain the genesis of the spinel corona. Corundum occurrences and deposits in northern Vietnam’s Yen Bai Province are located in marble and in partly migmatized gneiss of the Red River shear zone. The more than 1,000 km NW-SE trending RRSZ fault zone is one of Southeast Asia’s most distinct geological discontinuities with a left-lateral shear sense. Along the shear zone, several suites of high-grade metamorphic rocks were exhumed (see figure 1) between 35 and 17 million years ago (Leloup et al., 1995, 2001). The gneiss-hosted corundum deposits in Tan Huong–Truc Lau are located entirely within the Day Nui Con Voi range, which is composed of high-grade metamorphic rocks with sillimanite-biotite-garnet gneiss, mica schist, and amphibolite, all locally intercalated with marble lenses. These rocks appear to have been intruded by granite, syenite, and pegmatite of the Tan Huong magmatic complex (again, see figure 1). In contrast, the marble-hosted corundum deposits in the nearby Lo Gam zone occur in a thick metasedimentary sequence, composed of marble and overlying sillimanite-biotite-garnet schist (Long et al., 2004). These units, bounded by left-lateral faults, are intruded by granitic rocks and related pegmatite of Triassic age (Trinh and Vinh, 1997). Gneiss to partly migmatized gneiss containing gray, grayish white to bluish, and yellowish gray sapphire (figure 3, left). Examples include the Co Man outcrop at the Truc Lau valley and the Kinh La occurrence (Long et al., 2004; Thuyet, 2008; Nam, 2012; Khoi et al., 2016). Weathered feldspathic (pegmatoid) rocks usually found within gneiss, hosting dark red to pinkish ruby crystals. Occurrences include Slope 700 (figure 3, right) and kilometer markers 13, 15, and 23 along National Road 70 (Nam, 2012; Khoi et al., 2016). Marble in lenses and boudins intercalated within gneiss, mica schist, and amphibolite, containing ruby and sapphire—for example, the Slope 700 outcrop (Bao Ai occurrence), the Tan Huong drill core (Long et al., 2004), and the Truc Lau mine. Amphibolite transformed by metasomatism into biotite schist, bearing gray to dark gray sapphire—for example, the Km 15 occurrence (Long et al., 2004). Figure 3. Left: This sample of corundum-bearing gneiss from the Co Man outcrop contains mainly feldspar, bio­tite, sillimanite, and sapphire crystals up to 3 cm long. Right: Weathered feldspathic rock from the Slope 700 outcrop typically consists of kaolinite (Kln), vermiculite (Vrm), and ruby (Crn). Photos by N.V. Nam. 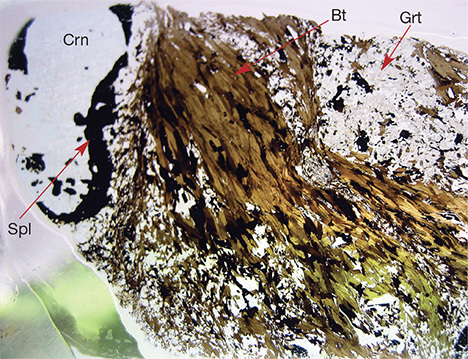 The corundum-bearing host rocks in the Tan Huong–Truc Lau area appear to have originated from the metamorphism of fine-grained sediments of variable composition (Katz, 1972, 1986; Simandl and Paradis, 1999; Khoi et al., 2010, 2011, 2016). For example, gneiss from the Co Man outcrop and the Kinh La occurrence has a wide compositional range: 50–90% feldspar, up to 40% biotite, and up to 20% sillimanite. 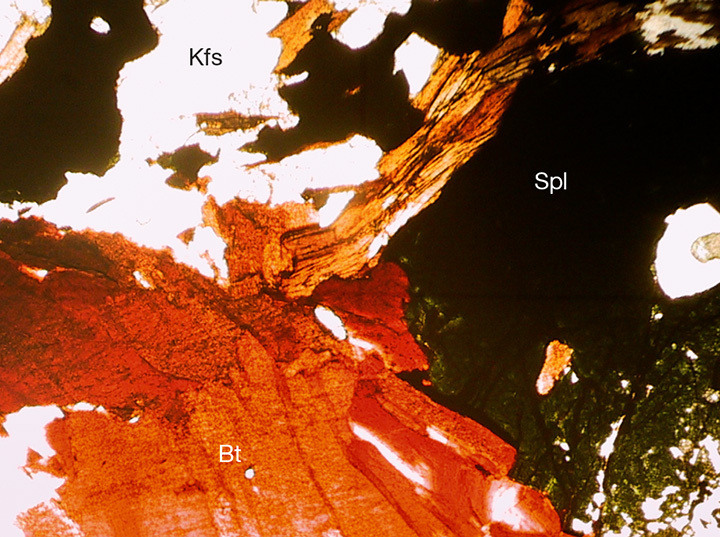 In addition, ruby-bearing feldspathic rocks (e.g., the Slope 700 outcrop) typically consist of K-feldspar and biotite (or vermiculite; again, see figure 3, right). Temperatures of 650–760°C and pressures of 5–7.6 kbar have been calculated for the metamorphism and corundum formation, which corresponds to upper amphibolite to lower granulite facies (Khoi et al., 2016). The primary deposits and host rocks are usually deeply weathered, forming numerous secondary deposits. The secondary (eluvial, diluvial, and alluvial) corundum deposits generally contain dark red ruby, pink sapphire, and red and brown spinel, as well as some garnet, trapiche-like bluish gray sapphire, sillimanite, and quartz. Corundum samples with spinel corona have been found in different primary and secondary deposits and occurrences in the Tan Huong–Truc Lau area. For this study, specimens were taken from the Kinh La primary occurrence and the Truc Lau secondary (alluvial) deposit. The Kinh La (Km 13) occurrence is located 2 km southwest of the Tan Huong mine, at 21°48′55″N, 104°52′12″E (again, see figure 1). The gem-bearing body is 0.1 to 1 m thick and 100 m long. The corundum ranges in color from black to bluish gray and from 0.1 to 5 cm in size (figure 4). Figure 4. In this outcrop at the Kinh La occurrence, several samples of primary corundum with spinel corona were collected for this study. Bt = biotite, Kfs = K-feldspar, Crn = corundum, Spl = spinel. Photos by N.N. Khoi. The Truc Lau deposit, located at 22°02′05″N, 104°40′46″E, occupies a large valley, about 5 km long, that contains eluvial and alluvial sediments (Khoi et al., 2011). The eluvium consists of three layers: topsoil (averaging 1 m thick); a gem-bearing layer (0.8–1 m thick) containing corundum and spinel that is composed of pebble, gravel, and sand; and a deeply weathered gneiss layer (3 m thick) that typically contains ruby and sapphire. Compared to the eluvium, the alluvial deposits at Truc Lau are thicker (approximately 10 m thick). Ruby, sapphire, and spinel are found within a gravel paleoplacer (1.2–5.0 m thick) that lies on bedrock and is buried below 0.5–3.5 m of Quaternary sediments and 0.5–1.5 m of topsoil (Khoi et al., 2011). Gem corundum here usually shows a tabular crystal form with deformed polysynthetic twinning along rhombohedral faces, and growth zones are typically sharp. Colors range from pink to pinkish red, and color irregularities such as zoning and spots or patches are rare. Many stones, particularly the sapphire, have low transparency due to abundant fracturing and inclusions. Mineral inclusions such as ilmenite, magnetite, plagioclase, muscovite, biotite, apatite, zircon, and chlorite are found in corundum from the primary deposits. Among these, dark inclusions (e.g., biotite, ilmenite, and magnetite) are most common. Primary and secondary gas-liquid inclusions also occur frequently in this corundum. 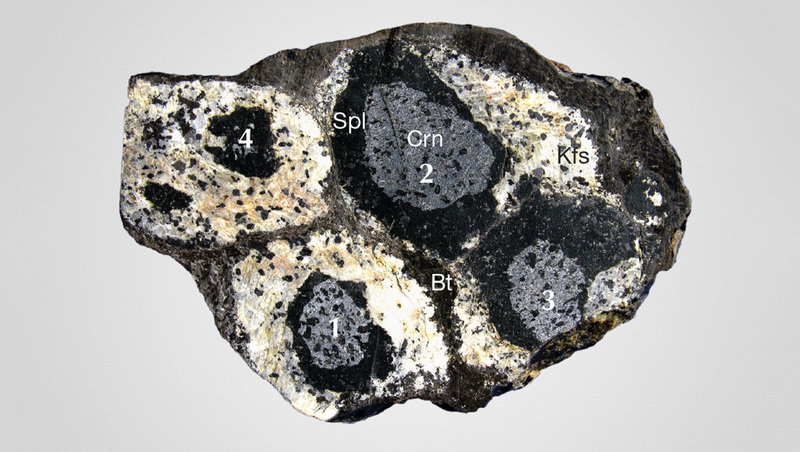 Common mineral inclusions in corundum from the secondary deposits are rutile, ilmenite, zircon, apatite, plagioclase, calcite, boehmite, and mica (margarite and muscovite), nearly identical to those in corundum from the primary deposits (Khoi et al., 2011, 2013, 2016). For this study, we analyzed 53 samples of corundum with spinel corona: 18 from the Kinh La primary occurrence and 35 from the Truc Lau placer deposits (figures 5–7). These samples were initially investigated using optical microscopy (gemological and petrological) and scanning electron microscopy (SEM). Mineral inclusions were identified with the help of Raman spectroscopy, SEM, and optical microscopy. 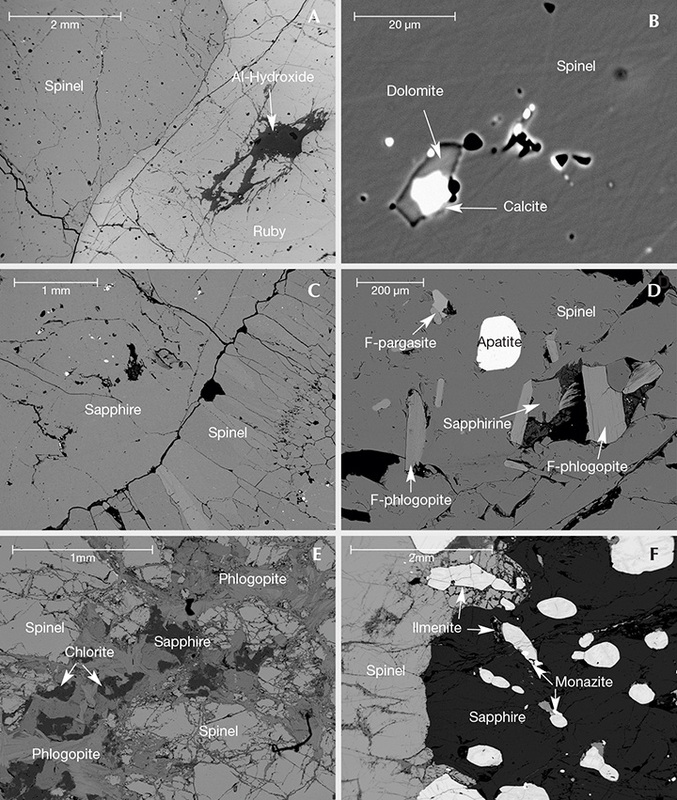 A quantitatively equipped standard electron microscope was subsequently used to analyze mineral chemistry of both the corundum host and the spinel corona in several specimens. Laser ablation–inductively coupled plasma–mass spectrometry (LA-ICP-MS) was applied for trace-element analysis of these samples as well as other alluvial gem corundum from Truc Lau for comparison and further discussion. Some of the chemistry data used in this study—such as trace-element composition of the corundum core and microprobe analyses of the spinel corona and other coexisting minerals from the Kinh La primary occurrence—were published previously (Khoi et al., 2013, 2016). Figure 5. Gray corundum coated by a black spinel (hercynite) layer, from the Kinh La primary occurrence. Photo by N.V. Nam. Figure 6. Left: Rough stones from the Truc Lau secondary deposit, some of which contain a spinel corona. Right: Twelve pieces of corundum with spinel corona were selected from the lot and used for this study. Photos by N.N. Khoi. Figure 7. Spinel-coated ruby (left) and sapphire (right) crystals from the Truc Lau deposit. Photos by N.N. Khoi. Major elements were determined by SEM analysis, using a JEOL 6310 unit equipped with a Link ISIS energy-dispersive X-ray (EDX) spectrometer and a Microspec wavelength-dispersive X-ray (WDX) spectrometer at the NAWI Graz Geocenter, Department of Petrology and Geochemistry, Karl Franzens University in Graz, Austria. Accelerating voltage was set to 15 kV and sample current to 6 nA on a probe current detector (PCD). The elements Al, Mg, and Zn were determined by EDX; Ti, Cr, and Fe were quantified by WDX. Detection limits were around 0.1 wt.% for EDX and about 0.03 wt.% for WDX. For additional analyses we used a JEOL JXA-8100 electron probe microanalyzer (EPMA) at the Department of Geology, Chulalongkorn University in Bangkok. Trace elements were determined by LA-ICP-MS using an ESI NWR193 laser ablation unit coupled to an Agilent 7500 ICP-quadrupole MS at the NAWI Graz Central Lab for Water, Minerals and Rocks, University of Graz and Graz University of Technology. Material was ablated using a 193 nm laser pulsed at 9 Hz and a 75 µm spot size corresponding to an energy of ~7 J/cm². Helium was used as a carrier gas at ~0.8 L/min flow, and data was acquired in time-resolved mode. NIST 610 and 612 glasses were routinely analyzed for standardization and drift correction. The glass standard BCR-2 was analyzed as an unknown and could be reproduced to within a 10% relative error. Aluminum was used as an internal standard. Mineral abbreviations presented here follow Whitney and Evans (2010). Corundum with Spinel Corona from Primary Deposits. At Kinh La, corundum occurs in a sillimanite + biotite + plagioclase + K-feldspar + ilmenite ± garnet ± hercynite ± magnetite migmatitic gneiss. The corundum crystals are often coated by hercynite-rich spinel (figures 5 and 8), with or without signs of corrosion. The corundum core in the samples is gray to dark gray, while the spinel rim is dark gray to black. The size of the corundum core frequently ranges from 10 to 30 mm, while the spinel corona has a thickness of a few millimeters to several centimeters. As can be seen in figure 8, the thickness of the spinel corona increases at the expense of the corundum core. Figure 8. Gray corundum coated by a dark spinel corona in sillimanite + biotite + plagioclase + K-feldspar + ilmenite ± garnet ± hercynite ± magnetite migmatitic gneiss. Sample H7005 from the Kinh La occurrence. Photo by N.N. Khoi. Under transmitted light, coarse twin lamellae and fractures are prominent in the corundum core. Frequently encountered in the corundum are ilmenite and magnetite inclusions (figure 9), as well as some zircon and apatite. Figure 9. Ilmenite inclusions in corundum core from the Kinh La occurrence, shown in cross-polarized light on the left and as a backscattered electron (BSE) image on the right. Photomicrographs by C.A. Hauzenberger. Under transmitted light, the spinel corona is green to deep green in color (figure 10) and translucent. It occurs as coarse xenoblastic crystals that formed during metamorphic overprint and took their outlines from neighboring crystals. Common inclusions in the spinel are biotite and K-feldspar. 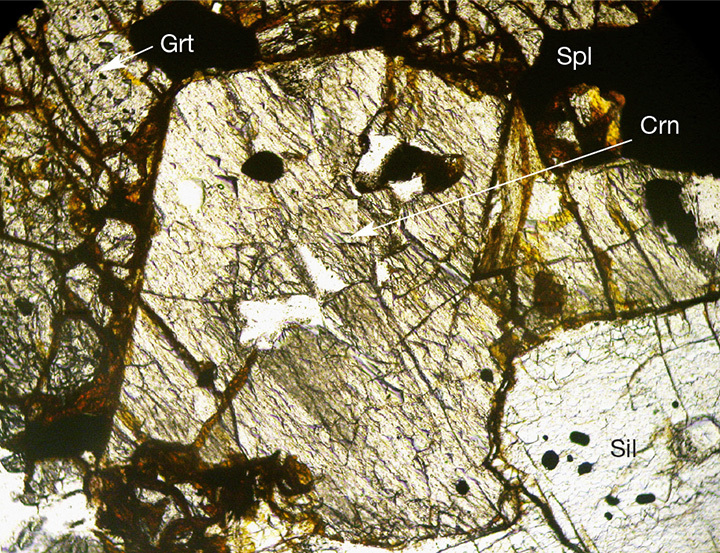 K-feldspar and plagioclase (figure 10) usually account for 20–70% of the ground mass, occurring as aggregates of tabular subhedral to anhedral crystals together with corundum, biotite, and hercynite. 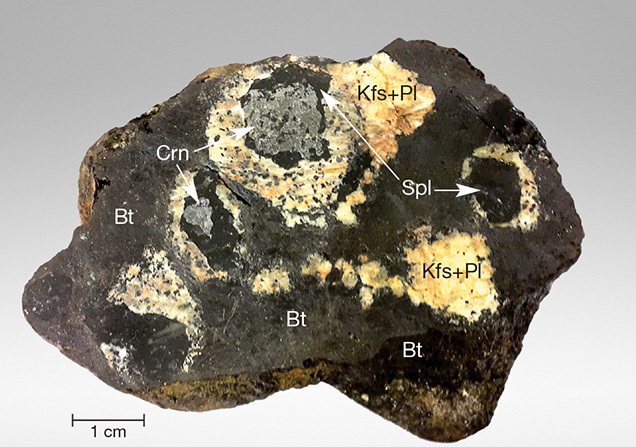 Biotite, accounting for 10–90% of the samples, occurs as aggregates of brown millimeter-sized flakes or alternating with K-feldspar, plagioclase, spinel, and corundum. Figure 10. Spinel (hercynite), biotite, and K-feldspar in sample H7005, migmatized corundum-bearing gneiss from the Kinh La occurrence, shown in parallel-polarized light. Photomicrograph by N.V. Nam; field of view 1.2 mm. Petrographic study of the samples also revealed other minerals, such as sillimanite, garnet, and quartz. The sillimanite usually has a long prismatic, needle-like shape. The garnet is subhedral to anhedral, strongly fractured, and millimeter- to centimeter-sized (figure 11). Figure 11. Biotite and garnet in sample H7005 from the Kinh La occurrence, shown in cross-polarized light. Photomicrograph by N.V. Nam; field of view 1.2 mm. Corundum with Spinel Corona from Secondary Deposits. Figure 12 shows hand specimens of corundum with spinel corona collected from the Truc Lau secondary deposit. The color of the corundum core shows much more variety than samples from primary deposits, ranging from white to gray to pink, pinkish red, and dark red. The shape of the internal corundum is mostly irregular to subrounded, and the boundary of the surrounding spinel corona is marked by a sharp change in color. Signs of corrosion are apparent in some samples. Almost all of the internal corundum grains are fractured to some extent and range in size up to tens of millimeters, and in rarer cases up to hundreds of millimeters. Some corundum grains show a distinct corona texture due to the presence of a spinel rim. The spinel corona has gray, dark gray to yellow, brown, and sometimes pink to grayish red color with a thickness ranging up to tens of millimeters. Grains have either comb-like (palisade) or xenoblastic texture. Figure 12. Samples of corundum with spinel corona from the Truc Lau secondary deposit. Photos by C.A. Hauzenberger. Inclusions were generally rare in all four types. 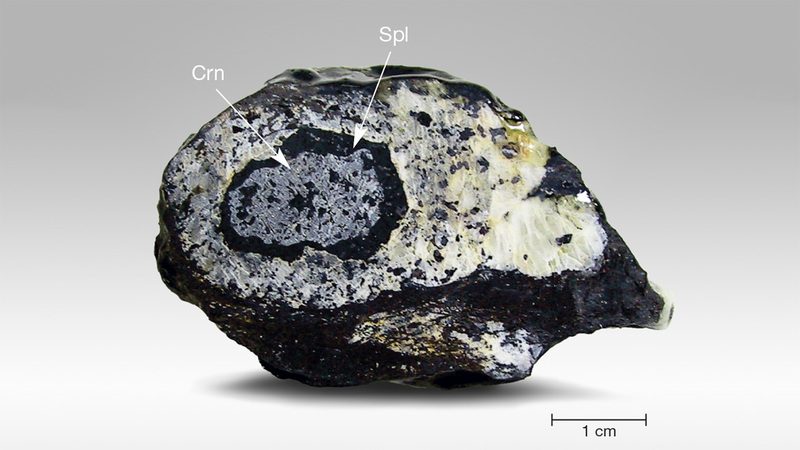 In each type, corundum typically contains Al-hydroxide and subordinate rutile inclusions (figure 13A). 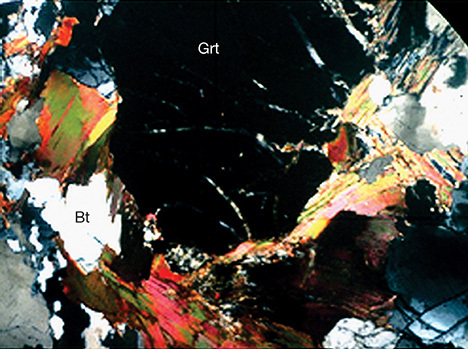 In the type I sample, calcite and dolomite were found in the spinel rim (figure 13B) while a Ba-rich feldspar and plagioclase were found in the corundum. The spinel rim in type II samples was partially developed as a series of elongated grains growing perpendicular to the sapphire surface and was either completely free of inclusions or showed only a few small calcite and dolomite inclusions (figure 13C). In one type II sample, sapphirine, fluorian pargasite, and fluorian phlogopite were identified in the spinel corona (figure 13D). Type III samples contain phlogopite and chlorite within the spinel corona (figure 13E). Type IV contains numerous ilmenite inclusions and a smaller number of apatite, monazite, and zircon inclusions (figure 13F). Figure 13. BSE images of inclusions in corundum cores and spinel corona. A: Al-hydroxide in corundum. The spinel is an inclusion-free type I. B: Dolomite and calcite inclusions in type I spinel. C: Apatite, sapphirine, F-phlogopite, and F-pargasite in the spinel corona of the type II sample. D: Palisade spinel rim around a sapphire (type II sample). E: Phlogopite, chlorite, and sapphire within the spinel corona (type III sample). F: Sapphire surrounded by a hercynite-rich spinel containing inclusions of ilmenite and monazite (type IV sample). Images by C.A. Hauzenberger. Corundum with Spinel Corona from Primary Deposits. The major element compositions of the corundum cores in samples from the Kinh La primary occurrence are shown in table 1, while trace-element contents by LA-ICP-MS analysis are from table 2.a in Khoi et al. (2016). In general, the corundum core showed high Fe content (5119 to 5717 ppm) and low Ti and Cr content (16 to 81 and 55 to 62 ppm, respectively). Other elements such as Ga, Mg, and V were found in all samples, but with low content. Representative analyses of the spinel rim and other minerals encountered with corundum from the Kinh La primary occurrence were also presented in tables 3.a through 3.d of Khoi et al. (2016). Generally, minerals of the samples from Kinh La are extremely iron-rich. The spinel is nearly pure hercynite with very low V and no Cr and Zn content. Garnet was observed in only one sample, with ~80 mol.% almandine content, grossular and pyrope contents of ~10 mol.% each, and spessartine below 5 mol.%. The biotite is nearly pure annite with some Tschermak substitution and up to 5 wt.% TiO2. The feldspathic matrix usually consists of plagioclase with XAb of ~0.75 and K-feldspar with albite content of about 25 to 30 mol.%. Magnetite and ilmenite are frequently encountered, either as inclusions in corundum, spinel, and garnet or as single phases in the matrix. Corundum with Spinel Corona from Secondary Deposits. Tables 2 and 3 present the analyses of the corundum core. Ruby has relatively low Cr2O3 values. The TiO2 concentrations are below the detection limit and the FeO values slightly above. The sapphire sample contained about 0.5 wt.% Fe2O3 and very low Cr2O3 and TiO2 values. Spinel corona compositions are shown in table 4. The composition is of a nearly pure Al-Mg spinel (sensu stricto), with only minor amounts of FeO (<0.7 wt.%, except the spinel corona around sapphire in one sample, with FeO = 1.27 wt.%), Cr2O3, and ZnO. Corundum with Spinel Corona from Primary Deposits. In many unaltered corundum-bearing rocks from primary deposits, the corundum crystals were enclosed by a spinel corona (figures 5 and 8). Petrographic investigation and, to some extent, the chemical composition of corundum grains with spinel corona from primary occurrences can be used to explain the genesis of the spinel corona. The Mg-Fe-Al-rich spinel and the hercynite-rich spinel corona samples were formed in migmatitic SiO2-undersaturated and Fe-rich gneiss. The mineral assemblage is typically corundum surrounded by a hercynitic spinel–magnetite phase, Fe-rich biotite, plagioclase, K-feldspar (figures 10, 15, and 17). In some samples the corundum and spinel are surrounded by garnet (almandine + pyrope + grossular or almandine-rich garnet; figures 14 and 16) and sillimanite (figure 16). Figure 14. Corundum + spinel + biotite + garnet mineral assemblage from the Kinh La occurrence, shown in parallel-polarized light. Photomicrograph by N.V. Nam; field of view 1.2 mm. Figure 15. Corundum with hercynite-rich spinel corona in a sample from the Kinh La primary occurrence, shown in cross-polarized light. Photomicrograph by N.V. Nam; field of view 1.2 mm. Figure 16. Corundum + spinel + garnet + sillimanite assemblage in a sample from the Kinh La primary occurrence (parallel-polarized light). Photomicrograph by N.V. Nam; field of view 1.2 mm. The significant amounts of Fe and Mg contained in the spinel grains, along with textural observations, suggest that the spinel might have been formed by the reaction of corundum and Mg-Fe containing silicate mineral, biotite, and/or garnet. This reaction could have been continuous until all the mica was exhausted or the corundum grains were completely transformed into spinel (see figure 17, stage 4). The reaction suggested on the basis of investigations of a hand specimen (figure 17) and a thin section (see figure 15) is illustrated in figure 18. Figure 17. Observed stages of spinel corona formation around corundum grains. As can be seen, from stage 1 to stage 4 the spinel rim around the corundum crystal became progressively thicker, while the corundum core became thinner (until exhausted) and less perfectly hexagonal. Photo by N.N. Khoi. Figure 18. Schematic illustration of the non-uniform enlargement of spinel corona due to the reaction of corundum and biotite. The corundum-spinel reaction would have continued until all the adjoining biotite was exhausted. This type of reaction is fluid dependent, and the chemical potential gradient in Al2O3 is the main driving force. As a result of this type of reaction, the quality of corundum was significantly reduced for almost all of the samples in the study. The above reactions, alone or in combination, are responsible for the observed corundum-spinel textural features. Similar to the samples from primary sources, the outer edges of the corundum core were also eroded to different extents, suggesting a disequilibrium between the two phases. As a result, the spinel rim around the corundum crystal became thicker and the corundum core became less perfectly hexagonal, depending on the stage of this corundum-consuming reaction (see figure 12). The difference between the spinels of different stages clearly indicates the role of the above hypothesized reaction, which led to the increase in the amount of spinel and thickening of the corona, with a simultaneous reduction in the amount of corundum. The spinel composition in types III and IV is a hercynite-rich spinel to hercynite with phlogopite inclusions (see again, figure 13E). In this case the above-mentioned reaction (1) could also be hypothesized for corundum → spinel transformation. The three equations above describing reactions of corundum → spinel transformation were calculated in a T vs. XCO2 diagram (figure 19). A T vs. XCO2 diagram is used instead of a P-T diagram to demonstrate the importance of fluid composition for the stability of mineral assemblages and hence possible mineral reactions, especially in metacarbonate. The observed spinel corona textures are evidence that a reaction must have proceeded quickly. While changes in P and especially T are usually relatively slow, a change in fluid composition can be accomplished very quickly and thus is the likely mechanism to produce the observed spinel corona. The spinel-forming reactions are strongly dependent on the mole fraction of CO2 in the fluid phase (XCO2). A drop in XCO2 below ~0.2 destabilizes corundum and dolomite, and spinel and calcite form at a temperature of about 600–700°C. 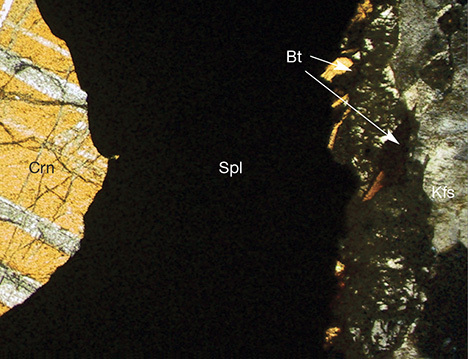 A final late-stage H2O-rich fluid infiltration is recorded in dia­spore veins (confirmed by Raman spectroscopy) cross-cutting the corundum core as well as the spinel corona, as shown in figure 13A. As seen in figure 19, this event must have occurred below 450°C. Figure 19. T vs. XCO2diagram showing the phase relations and mineral reactions that formed the spinel corona. The arrows indicate the possible direction to overstep the reactions (T increase or change in fluid composition). Spl = spinel, Kfs = K-feldspar, Sil = sillimanite, Bt = biotite, Crn = corundum, Dsp = diaspore, Cal = calcite, and Dol = dolomite. Here, the Mg biotite end member phlogopite reacted with corundum to form pure Mg spinel. As shown above, corundum occurrences and deposits in northern Vietnam are hosted not only in marble of the Lo Gam structural zone, but also in partly migmatized gneiss of the Day Nui Con Voi range in the Red River shear zone (see again, figure 1). It is interesting to note that until now corundum crystals with spinel corona were found only in the so-called gneiss-hosted deposits, both primary and secondary, in the Tan Huong–Truc Lau area (Khoi et al., 2011, 2016). Local gem dealers call the spinel-encrusted corundum “gamble merchandise” (hàng mở bát) or “coated merchandise” (hàng bọc), indicating the uncertainty of dealing with these goods. 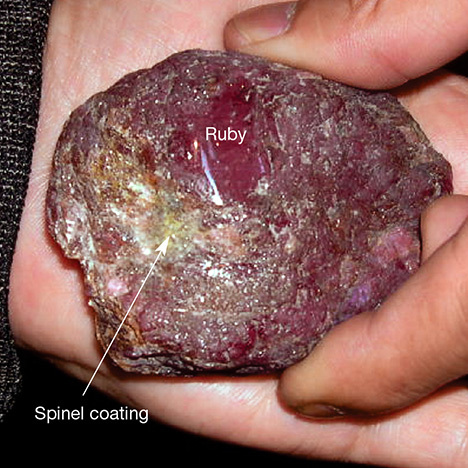 Cutting away the spinel crust sometimes reveals gem-quality ruby inside (figure 20). Figure 20. Cutting away the spinel coating revealed a high-quality internal ruby core. Photo by N.N. Khoi. Corundum with a spinel corona is a noteworthy characteristic of both primary and secondary deposits of the Tan Huong–Truc Lau area in the Red River shear zone of northern Vietnam. Typically, corundum formed during regional prograde, upper amphibolite to lower granulite facies metamorphism (650–760°C and 5.0–7.6 kbar) from an originally sedimentary deposited Al-hydroxide phase such as diaspore and/or boehmite (bauxitic layers). These reactions, either singularly or in combination, might have given rise to the observed corundum-spinel textural features. The macroscopic reaction textures associated with corundum are important in the sense that they reveal how it was affected after formation. Because of volume change during the transformation of corundum to spinel, fracturing occurred in the involved phases, and these fractures were often filled with retrograde reaction products such as diaspore. Hence, the gem quality deteriorated substantially after the formation of the corona. Dr. Khoi (khoinn@vnu.edu.vn) is an associate professor of geology at the Hanoi University of Science and director of the DOJI Institute and Laboratory for Gemology and Jewelry. Dr. Hauzenberger is a professor of petrology and geochemistry at the University of Graz, Austria. Dr. Sutthirat is an associate professor of geology in the Faculty of Science and director of Environmental Research Institute at Chulalongkorn University in Bangkok. Mr. Tuan is vice general director of DOJI Gold & Gems Group in Hanoi. Dr. Häger is senior scientist at the Centre for Gemstone Research at Johannes Gutenberg University and lecturer in gemstone and jewelry design at the University for Applied Sciences in Idar-Oberstein, Germany. Dr. Nam is senior researcher of the Vietnam Institute of Geosciences and Mineral Resources in Hanoi. This research is funded by the Vietnam National Foundation for Science and Technology Development (NAFOSTED) under grant number 105.02-2012.08. We would like to thank ASEA-UNINET for financial support. We also thank DOJI Gold & Gems Group and its technical staff for their assistance with this work. Research facilities were provided by the Institute of Earth Sciences (Mineralogy and Petrology) at Karl-Franzens-University of Graz (Austria), the Institute of Geosciences (Gemstone Research Center) at Johannes Gutenberg University (Mainz, Germany), the Hanoi University of Science (Vietnam National University), Chulalongkorn University (Bangkok), and the Vietnam Institute of Geosciences and Mineral Resources. Francis M.D.P.L., Dharmaratne P.G.R. (2002) Corundum/spinel reaction textures in carbonate-origin rocks, Sri Lanka—Preliminary observations. The Australian Gemmologist, Vol. 21, No. 5, pp. 211–214. Francis M.D.P.L., Matsueda H. (2004) Study of macroscopic and microscopic reaction textures associated with corundum of Balangoda region, Sri Lanka. Proceedings of International Symposium on “Dawn of a New Natural History—Integration of Geoscience and Biodiversity Studies,” Sapporo, March 5–6, pp. 129–136. Häger T., Khoi N.N., Tuan D.A., Huong L.T.T., Hofmeister W. (2010) Ruby and sapphire rimmed by spinel from the Luc Yen–Yen Bai gem mining area, Vietnam. 20th General Meeting of the International Mineralogical Association: Abstracts, Budapest, August 21–27, p. 27. Hauzenberger C.A., Häger T., Wathanakul P., Khoi N.N., Nantasin P., Goessler W. (2010) Petrology and geochemical characteristics of ruby with associated spinel corona from Truc Lau, N. Vietnam. Proceedings of the 5th International Conference on the Provenance and Properties of Gems and Geo-Materials, Hanoi, October 17–24, pp. 23–28. Hauzenberger C.A., Khoi N.N., Sutthirat C., Häger T., Wathanakul P., Tuan D.A. (2012) Ruby with associated spinel corona from Truc Lau and Kinh La, North Vietnam. Proceedings of the 3rd International Gem & Jewelry Conference (GIT 2012), Bangkok and Chanthaburi, December 12–16, pp. 123–126. Katz M.B. (1986) Review of the geology of the gemstones of Sri Lanka. Australian Gemmologist, Vol. 16, No. 2, pp. 52–56. Khoi N.N., Sutthirat C., Tuan D.A., Nam N.V., Thuyet N.T.M., Nhung N.T. (2010) Comparative study of rubies and fancy sapphires from two different deposit types in Yen Bai Province, Vietnam. Proceedings of the 5th International Workshop on Provenance and Properties of Gems and Geo-Materials, Hanoi, October 17–24, pp. 212–223. Khoi N.N., Hauzenberger C.A., Sutthirat C., Tuan D.A., Thuyet N.T.M., Duong N.T., Nam N.V., Lam C.V. (2013) The characteristics of gneiss-hosted corundum deposits of Tan Huong-Truc Lau area, northern Vietnam. Proceedings of the 33rd International Gemmological Conference (IGC33), Hanoi, October 13–17, pp. 25–28. Long P.V., Vinh H.Q., Garnier V., Giuliani G., Ohnenstetter D., Lhomme T., Schwarz D., Fallick A., Dubessy J., Trinh P.T. (2004) Gem corundum deposits in Vietnam. Journal of Gemmology, Vol. 29, No. 3, pp. 129–147. Nam N.V. (2012) Mineralogical and chemical composition and formation conditions of rubies and sapphires in metamorphic rocks of Tan Huong-Truc Lau area (Red River zone). PhD Thesis, Vietnam Institute of Geosciences and Mineral Resources, 181 pp. [in Vietnamese]. Simandl G.J., Paradis S. (1999) Corundum in alumina-rich metasediments. In G.J. Simandl, Z.D. Hora, and D.V. Lefebure, Eds., Selected British Columbia Mineral Deposit Profiles, Vol. 3, Industrial Minerals and Gemstones. British Columbia Ministry of Energy and Mines, Open File 1999-10, pp. 105–108. Themelis T. (2008) Gems & Mines of Mogok: The Forbidden Gem Land. Published by the author, Bangkok. Thuyet N.T.M. (2008) Study on typomorphic and gemological characteristics of corundum from some genetic types of deposits in Yen Bai and Dak Nong Provinces of Vietnam. PhD thesis, Hanoi University of Science, 133 pp. [in Vietnamese]. Trinh P.T., Vinh H.Q. (1997) Sketch tectonic map of Luc Yen area, Scale 1:200,000. Institute of Geological Sciences, Hanoi [in Vietnamese]. Vinh N., Ed. (2005) Geology and Mineral Resources of Vietnam, Yen Bai Sheet, Scale 1:200,000 (F 48 XXI). Department of Geology and Minerals of Vietnam, Hanoi. Xuyen T., Ed. (2000) Geology and Mineral Resources Map of Vietnam, Bac Quang Sheet, Scale 1:200,000 (F 48 XV). Department of Geology and Minerals of Vietnam, Hanoi. Explores the emergence of the Luc Yen area as a producer of corundum, spinel, tourmaline, and other colored stones. Primary and secondary deposits in the Tan Huong–Truc Lau area of northern Vietnam’s Yen Bai Province have supplied rubies and some sapphires for more than a decade. 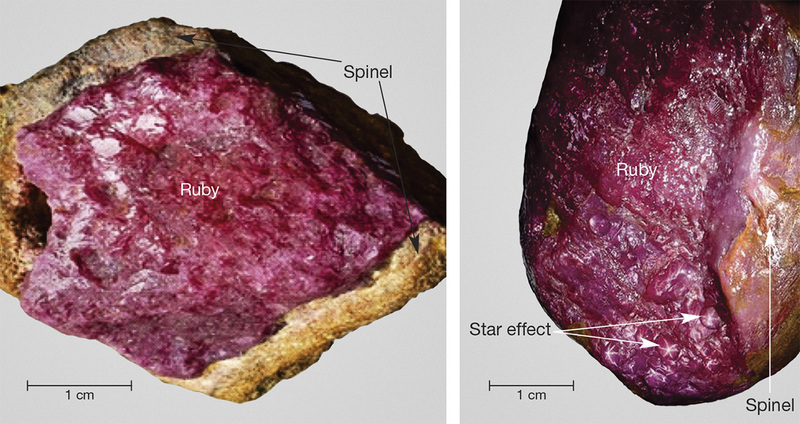 Ruby crystals from Southeast Asia with a fixed six-rayed star, similar in effect to trapiche emeralds from Colombia, are described.